You may have guessed I'm a huge beauty product junkie, but for me inner beauty has always been even more important than outer beauty. I always make sure to appreciate others for who they are as an individual and see the true beauty in someone's personality. I don't talk about it often, but I was bullied as a kid for the way I looked, so I learned early on that it's what's on the inside that's important. There is also another kind of inner beauty that I rarely talk about here on the blog because I'm usually focused on makeup and skincare and products that go on the outside of your body. Don't get me wrong, those things are so much fun to talk about, but sometimes with the steady stream of never-ending new makeup launches, I always forget to mention how I supplement my beauty routine from the inside! 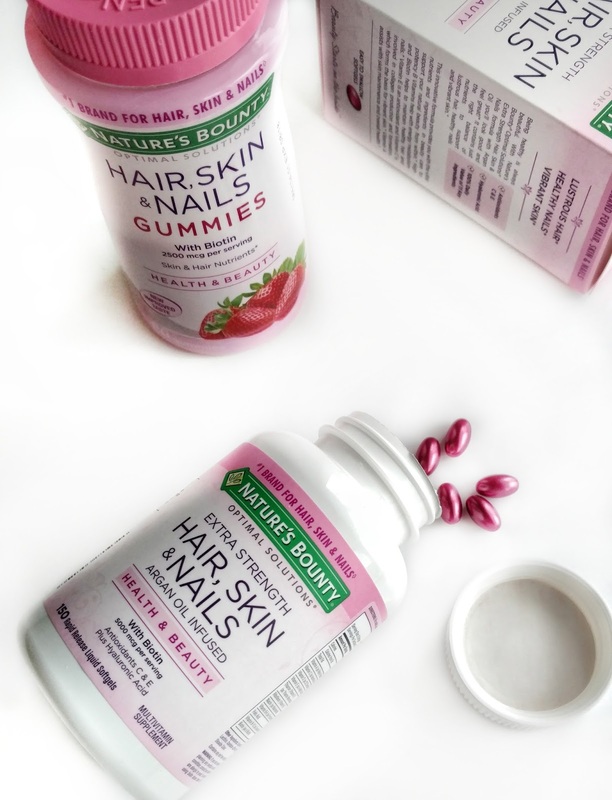 For the past six months or so, I've been taking the Nature's Bounty Hair, Skin & Nails Gummies ($9.49 at Walgreens in the beauty aisle), and the nutrients in them have definitely helped me to feel not just healthy but more beautiful as well. When Nature's Bounty contacted me and asked if I would post about them, I was thrilled because it's a product I've already been using for a while and totally believe in! 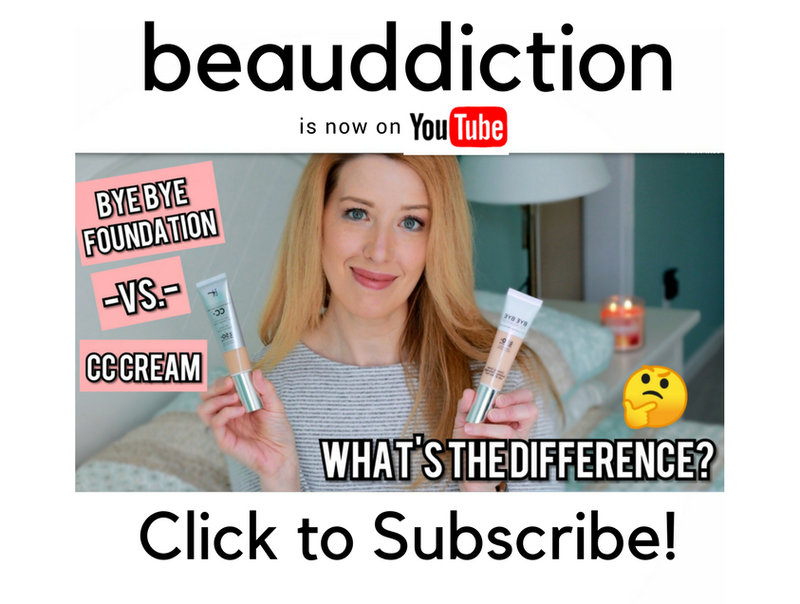 For me, it's a no-brainer because if my hair, skin, and nails have the nutrients they need for a healthy foundation, then all of the products I use on the outside will work that much better! 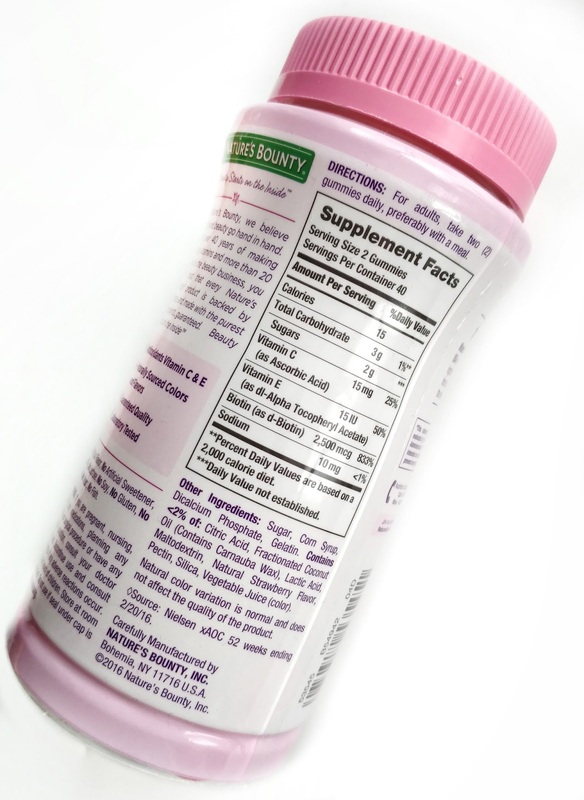 I'm not a big fan of swallowing pills, so I prefer the gummies but Nature's Bounty also makes a softgel formula. The gummies are a delicious strawberry flavor that I look forward to taking every day (they don't have any aftertaste that I've noticed) and are made with naturally sourced color and flavor. They are also free from artificial flavor, milk, lactose, soy, gluten, wheat, yeast, fish, or sodium. 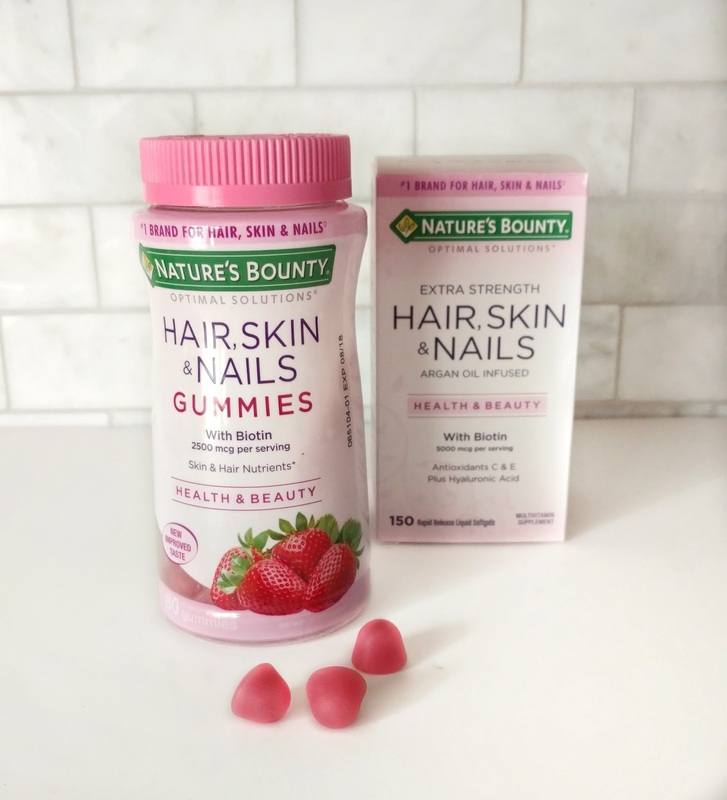 Visit the beauty aisle of your local Walgreens to try them and then take the Nature's Bounty Hair, Skin & Nails Challenge to try them risk-free for one month. Nature's Bounty is so confident in their product that if for any reason you don't like them, they'll give you your money back (see the guarantee here). You can sign up for the challenge here. Also, join me and Nature's Bounty for a Twitter Chat on March 23rd (2-3 pm Eastern) where I'll be sharing my best beauty tips and ways to revamp and refresh your beauty routine for Spring (you can sign up for the chat here). 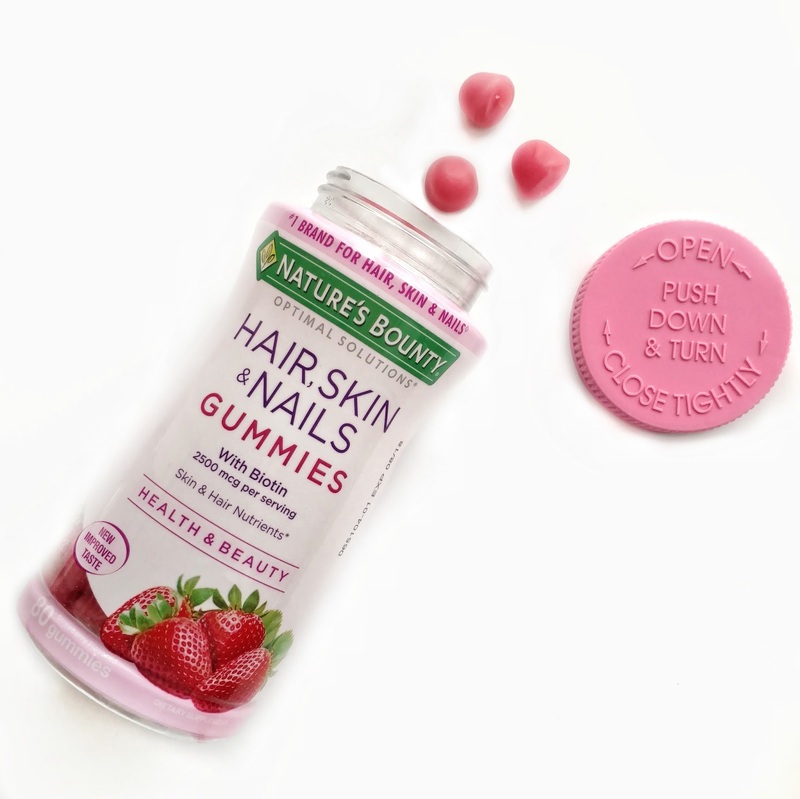 Five participants will win a $50 gift card and their own bottle of Nature's Bounty Hair, Skin, & Nails Gummies. What's your inner beauty routine? I'd love to hear about it in the comments below! Disclosure: This is a sponsored post. The products featured were provided to me free of charge for review purposes (but I have purchased them myself in the past). I love these gummies. I discovered them at CVS a while ago, maybe back in January? I was looking for something to keep my hair from breaking off and make it stronger. I have really seen a difference since taking these! After about a week I didn't have as much hair in the drain of the shower and now there are times I wash my hair and see nothing in the drain! I have also noticed thicker, longer lashes which is an added bonus! Great post, everyone should know about these. I was just looking at the gummies on Monday and was wondering if it really worked. Thank you for this blog. I signed up for the challenge and will start next week. I'm going to give it a try and see if it makes any difference. I've been wondering about health supplements for beauty these days. Have you seen the "dirty lemon" collagen drink ads on facebook? It kept popping up and I really wondered if drinking collagen every day would make a difference. This seems like a cheaper alternative. hahaha can't wait to give it a try! I aim for 75 ounces of water per day. I really think it makes a difference in the way my skin looks and the way I feel. I try to drink a lot of water too. It truly does make a difference...I also get headaches if I'm dehydrated. I LOVE these gummies and don't like swallowing pills and I can't leave them in my desk at work so I don't forget them and no one has to hear the rattling of a pill bottle. I did notice some nail growth after 2 months BUT you have to be consistent. Once I stopped they gradually split and started to breat but my manicures looked like I had acrylics! They were long enough for nail art. I can't wait to hear others results. I take calcium & vitamin D supplements, a daily mulit-vitamin, and drink lots of water. I'm interested in these gummies.